Watt's Up? : What is line effect and how does it affect my testing? What is line effect and how does it affect my testing? Let’s say the voltage line effect specification for a 20 V, 5 A power supply is 1 mV and is specified for any line change within ratings. And let’s say that the AC input line voltage range for this power supply for a nominal 120 Vac line is -13% to +6% (104.4 Vac to 127.2 Vac). This means for any AC input line voltage change within the rating of the supply, the output voltage will not change by more than 1 mV. For example, if the power supply is set to 10 V, the actual output may measure 9.999 V at low line (104.4 Vac). (Note that the difference between the setting and the actual output voltage is a different specification called programming accuracy.) If you then increase the AC input line voltage from low line (104.4 Vac) to high line (127.2 Vac), the line effect specification guarantees that the output voltage will not change by more than 1 mV, so it will be somewhere between 9.998 V and 10.000 V. So if the actual output voltage started at 9.999 V at low line and measured 9.9994 V at high line, the line effect for this output when set for 10 V measures 0.4 mV (9.9994 – 9.999), well within the 1 mV specification. You must make the second voltage measurement immediately following the line voltage change to avoid capturing any short-term drift effects. And what does “with all other influence quantities maintained constant” mean? Things like temperature and output loading can affect the output parameter, so these things must be held constant in order to see only the effect of the line change. 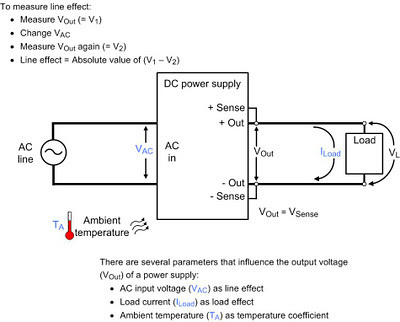 The effects on the power supply output of changes in each of these influencing quantities (temperature, output load) are described in different specifications. Most performance power supplies have line effect specifications of about 1 mV or less. A lower performance model may have a line effect specification of up to 10 mV or more. Power supplies with higher maximum voltage ratings and higher maximum power ratings typically have higher line effect specifications. 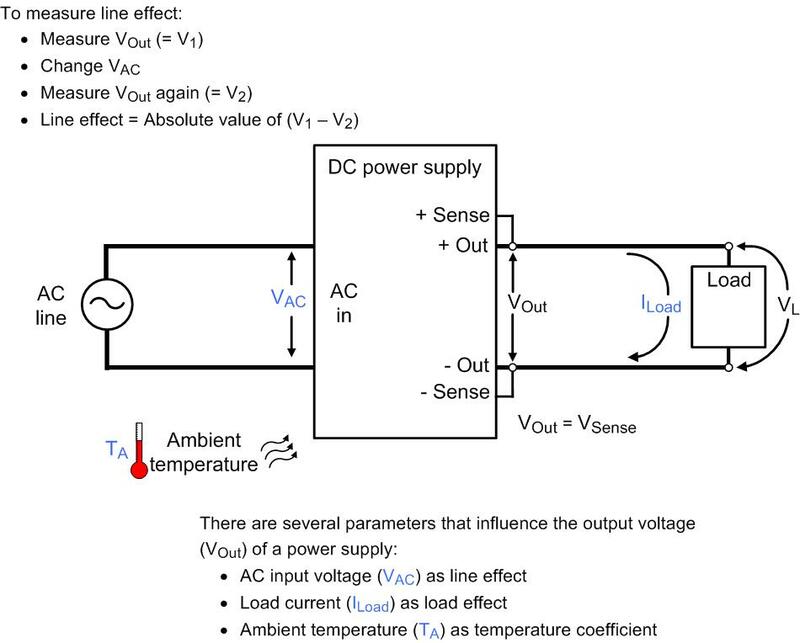 If you have an application where maintaining an exact voltage at your DUT is critical and your AC input line can vary throughout the day, you will want to use a power supply with a low line effect specification. 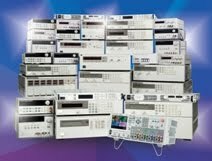 If changes in the voltage at your DUT are less critical to you, most power supplies will perform well for your application regardless of line voltage behavior.